Women may have finally smashed through the glass ceiling to join men in the boardroom but when it comes to office temperatures they are yet to come in from the cold. 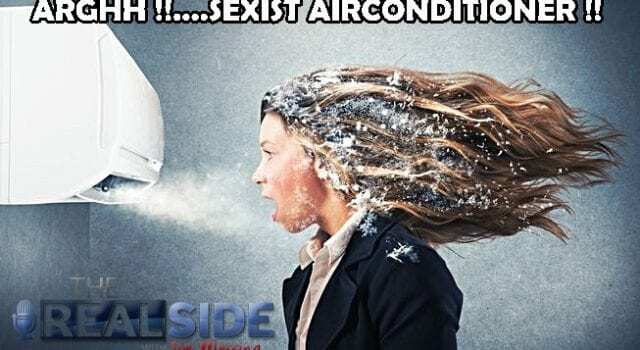 A new study has shown that air conditioning units are designed for the body temperature and metabolism of men and leave most women shivering . Most climate control systems in modern offices are based on the resting metabolic rate of a 40-year-old man, which runs up to 30 per cent faster than a woman’s. So while men are comfortable in the workplace, the majority of women would need conditions to be nearly four degrees warmer, leaving them forced to don jumpers and cardigans in the summer to keep warm. “The main message is that in the current standards the value for the heat load of a building is based on an average male. This overestimates the metabolic rate of women on average by 20 to 30 per cent,” said lead author Dr Boris Kingma from Maastricht University Medical Centre in the Netherlands. “It’s the time of year desperate women rely on cardigans, pashminas and space heaters to make it through the workweek in their frigid offices,” she wrote. But while supporters across the world applauded her comments, others were quick to blame women for wearing too few clothes in the summer. “Gosh, it’s almost as if the people wearing heavier clothing might be warmer than the women in linen dresses would be,” said New York blogger Cassy Fiano. However the new study suggests women really are suffering in a chilly workplace. Next articleIm dreaming of a Black Christmas?